This try against Fiji in November 2014 was Alex Cuthbert's 15th in a Wales shirt. Wing Alex Cuthbert has made a bold decision in turning down a national dual contract, former Wales and Lions centre Dafydd James says. National coach Warren Gatland announced on Tuesday the Blues player had declined a contract offer. James believes the 24-year-old British and Irish Lion is preparing a move to a club outside Wales. 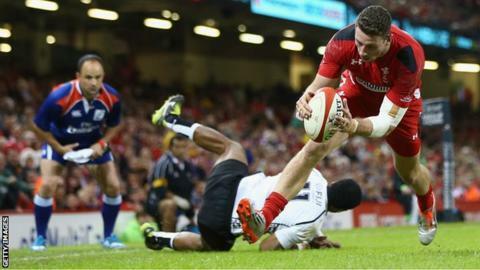 "I think it's a gutsy move by Alex Cuthbert to be quite honest with you," James told BBC Radio Wales Sport. "You can see that he's got aspirations - reading between the lines - to play further afield perhaps in France or England and he's holding out for a big pay day by the sound of it. "But with the World Cup imminent and not really impressing people with his on-the-field form I think that's a bit of a risk really." Cuthbert still has a year to run on his contract at Cardiff Blues and has been named in Wales' 34-man squad for the 2015 Six Nations championship. He has made 30 appearances for Wales, scoring 15 tries. He also crossed for a touchdown in his one Test appearance for the Lions in the first Test against Australia in 2013. Seven Welsh players have already agreed to the new contracts, which are 60% funded by the Welsh Rugby Union with the region paying the rest of the salary. They are Samson Lee, Sam Warburton, Dan Lydiate, Jake Ball, Tyler Morgan, Hallam Amos and Rhodri Jones. The creation of dual contracts was part of a £60m deal between the WRU and regions over funding and governance of the game in Wales. Dual-contracted players are limited to 16 regular-season games for their regions plus any knockout games. At a news conference to explain his 2015 Six Nations squad selection, Gatland said workload limit gave dual-contracted players an advantage. "It won't affect selection, but there is an obvious advantage to players in terms of the number of games that they play for their regions," Gatland added. James said he admired Cuthbert's confidence. "He's got a plan, he's backing himself you've got to take your hat off to him. "He's played exceptionally well when he has played for Wales but it's a very bold move, isn't it?"